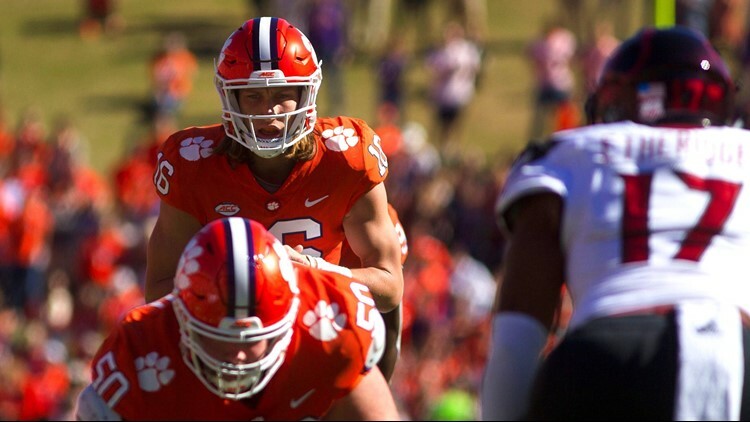 Clemson freshman quarterback Trevor Lawrence is gearing up for his first prime time kickoff and it will come in the cool air of Chestnut Hill. Division title on the line. “I don’t really get nervous,” says Clemson quarterback Trevor Lawrence. And why should he? He’s just having fun. The fact that Saturday night’s showdown between No. 2 Clemson and No. 17 Boston College will unfold in Chestnut Hill, Massachusetts, only adds to the appeal for the long-haired kid from Cartersville, Georgia. Everything is cool for Lawrence, the laid-back 19-year-old who has seized leadership of a team only one victory away from securing a fourth consecutive trip to the Atlantic Coast Conference Championship Game. He wasted little time in announcing his arrival this season, tossing three touchdown passes in a season-opening victory against Furman, then unseating incumbent quarterback Kelly Bryant by Game 5. Lawrence has since emerged as one of nation’s top rookie quarterbacks, leading all FBS freshmen in passing efficiency and touchdowns. His 18 touchdowns lead the ACC despite Lawrence not starting any of the team’s first four games. On Wednesday Lawrence was the only freshman in the nation to be named one of 16 semifinalists for the Davey O’Brien Award, which is presented annually to the top college quarterback.